The exhibition is open, but; the materials for the booth are still on their way! Starting an exhibition Mexican style; booths still being build. Paulo de Carvalho, Arjen van Dijk, Erik van Geest and Goncalo Tavares (also known as Mega Tank Master) of NPI, exhibiting at the show for the first time. Frank Ocampo of the Greenery exhibiting their Dutch Conference pears at the booth of Aweta. Javier Zavara Constantini and Artemio Martinez Hernandez of Oxuon exhibiting at the Expo Agroalimentaria for the first time. The team of French greenhouse manufacturer Richel. They are already present in Mexico since 1993 and established a local operation in 2014. From 2000, they have seen the horticultural industry in Mexico growing rapidly. Roland Pereira and Emanuele Garrasi of Agriplat. This Italian greenhouse plastic supplier does already a lot of business in the Midde East, Inia, North America and Spain, where they have a division as well. Mexico is beginning to become a big market for them and they are there decided to exhibit at the show. This is their first year where they are also looking for distributors and agents. The team of greenhouse constructor FiLCLAir. They currently sell in over 60 countries and is supplying the Mexican growers for about 12 years now. Recently, they sold 5 ha in the Agropark and over there, they now have 23 ha it total. The team of PSI Plastic presenting their new spacers; one for the berry production (second on the right) and one for the tomato, cherry tomato and pepper production. This Mexican company currently supplies nationally, but is eager to expand in South and North America. Miguel Grego of Smarthydro presenting their hysroponic and hydrotech systems. It is an Italian company that has a distributor in Mexico. They just started to supply the Mexican growers three years ago and sees an increase in demand. Cesar Hernandez of Republic Steel Wire Mexico. This brand was launched last year and the founder of it is Grupo San. Part of the team of Stolze. Carlos Ponce Macias of Bayer with their models. Michelangel Pnce, Servio Cotaponce, Liliana Noriega and Luise Fernando Gaxiola of Invergrow. This greenhouse manufacturer is known as Novagril in Spain. Leonardo Ledesma and Ricardo Martinez of Asesores en invernaderos. They are dealers of several (around 17) international companies and can supply everything from a complete greenhouse with all the supplies, packaging and technical maintenance. Yosef Giles of Mardenkro works with Asesores en invernaderos. Nolbert Castro, Mayra Colmenero, Adam Dunford and Edgar Soto of Rivulis and Eurodrip. This company supplies all kind of low volume irrgation and is specialized in drip tapes and drip liners. Last year, these companies merged and they have factories in 16 countries, including one in Leon, Mexico. A new factory is about to open in a few weeks. Sergio Rivera, Inti Rodriguez and Felippe Xanxni of Grupo Inveco, a Mexican distributor of several greenhouse products. Kekkila is one of thei products Grupo Inveco supplies in Mexico. On the picture Felippe Xanxni. Geoffrey Gomis of Harnois. This French greenhouse manufacturer also notices that the Mexican growers are eager to grow. Phalaenopsis attracting the attention of many visitors. The disinfection system of Royal Brinkman. Together with their machinery, these are the main themes at their booth this year. Arturo Flores Regla Stigma (the agent of Anthura in Mexico) together with Marco Knijnenburg of Anthura. This Dutch anthurium and phalaenopsis breeder is exhibiting at the Expo Agroalimentaria for several years now. From the “bigger is better” mentality they are seeing a trend developing towards smaller varieties over the last three years. The model of Royal Mesh Company. Francisco Negrete Lopez of Tunelcrop and Daniel Solis Barreras of Icapsa. Icapsa. They distribute several products, including Frigocel and Pro-Mix. The team of Pelemix. Mexico is a big market for them and they have an office, warehouse and storage in Guadalajara. The team of Premier Invernaderos, a Mexican greenhouse supplier. Alfonso and Arthur Jimenez of Biogea Nursery Plants. Juan Pablo Saucedo of AgroSense showing a visitor how to use TomSystem and how it saves labor as it clips 1,600 tomato plants per hour. It is on the Mexican market for about 8 years and over the last three years, he has seen the demand growing for this product. Alejandra Vasquez and Guillermo Gonzalez of Jiffy. Lu Shushan, Mr Zhang (President of the company) and Frank John of Kingpeng were exhibiting at the show for the first time. This Chinese greenhouse manufacturer is already exporting to over 60 countries and is now exploring the possibilities to supply Mexican growers, they are exhibiting for the first time. Honjie Leng and Gery Zhang of XTB are exhibiting at the show for the second time, offering their services to the Mexican growers. Dionisio Tendero Gimbert of De Gier presenting their new GMW Motor Gearbox. It is one gear and the strength of the gear depends on the electrical motor. One can easily separate the electrical motor from the gear without taking the gear out of the greenhouse. The new GMW Motor Gearbox of De Gier. Ben van den Bos, Jacob van den Bos and Eaulalio Fonseca of Van den Bos Seeds. Mauro Sala and Luis Erick Hernandez of P-Tre Greenline. Arjen van Dijk of NPI (in the middle) with Dhilan Kanakia (left) and Rodolfo Yamiz (right) of KT exports. KT exports is planning to start up a new company that will sell, among others, the tanks of NPI and greenhouse films. The team of Ulma, a Spanish greenhouse constructor. For them, Mexico is a big market and they have a subsidiary here. Daniel Madrigal and Carlos Quintana of Aweta, a Dutch company specialized in sorting machines for fruits and vegetables. Luis Arturo Garcia of Plant Factory. They supply young plants; grafted tomatoes and sweet peppers, to Mexican high-tech producers. The company was established last year and they only work plants from seeds that are GSPP certified and only work with rock wool. Stefano Liporace and Valerio Torelli of Vifra. Nicolas Delon of Grodan sees the business growing every year. Daniel Sahagun and Raul Ruiz Valensuela of MSC. Busy at the entrance of the Expo Agroalimentaria. Glory Lu (on the righ) of Rimex Invernaderos, a Mexican greenhouse builder, received some visitors; Raul Martinez of Inagro, Violeta Ruiz and Carlos Mena of Agroinsuma. Roberto and his son Robert Felix of Neonatura. They supply growers in iMexico and Central America with all kind of solutions, like fogger systems and greenhouse automation. They were exhibiting at the show for the fist time. The team of FMC all posing for the photo. Marcella Cvevas, Erick Vazquez Quitero and Angel Cavarrubias of Greenvass. From Spain, they import products like plastic parts, sticky traps seed tray covers grafting clips. The team of Agrosistemas Viale. Viali Sistemi is an italian manufacturer of drive equipment and the company in Mexico is named Agrosistemas Viale. They also represent Italian companies Termotecnica Pericoli and Recar in Mexico. The team of Leyton Greenhouse. They represent Russel IPM, Toro, Sudlac and Priva in Mexico. This year, in 2018, they achied one of their bigger goals, which was; working with the top 3 biggest Mexican growers with Sudlac. Luis Sanchez Navarro of Sungro horticulture. The Team of Royal Brinkman Mexico; Nico, Ben, Diego, Edmundo and Marcella At their booth this year, they are presenting several solutions in two main themes; Mechanisation and disinfection. Eduardo Rojas of Peat Foam promoting Inorganic foam for organic propagation or any other production. This Mexican company also exports their products to Puerto Rico, Peru, Chile and Portugal. Jaime Aguirre Venegas, Cesar Hernandez and Manuel Soto of Paskal. Busy at the booth of Irritec. The team of Horticultorres, a distributor in Mexico for Fibredust, Ellepot and Blackmore. Plastinver represents Milleniumsoils Coir, Klasmann Deilmann and SanSan in Mexico. On the photo from left to right: Angel Vigueras, Benjamin and Oscar Alvarez of Plasatinver together with Martin Nugteren of Klasmann Deilmann and Jorge Escobar of Milleniumsoils Coir. The team of Hoogendoorn; Inigo Ochod, Alejandro Mejia, Jorge Caballero, Martin Helmich and Carlos Valdelamar. Peter Hendriks of Lets Grow. Dutch Plantin exhibiting for the first time. They see an an increased demand for their coco bags, also here in Mexico. Recently, Julio del Toro (second on the right on the photo) started to import Dutch Plantin products and distribute it on its own Mexico, he is now partner of Dutch Plantin in Mexico. Others on the picture are (fltr) Sinby Hoseph, Marian de la Llave and Wim Roosen. Oswaldo Mendoza Jiminez and Enrique Garcia Ortiz of Centro Semillero distribute Sakata and Seminis products. Mauricio Olvero , Gerardo Perez Jamaica and Agur Arredondo of KBW Supply. They are a distributor of T.O. Plastic, Liventia and Berger. Iuon Valencia and Jesus Yoguez of Tunneltek. Next to supplying Mexican growers, they also export to the US and Chile. The team of AMAG. They supply organic fertilizers and their Head office is based in Huston (TX), USA. They produce their products at this location in the US (by Sigma AgriScience) and export them to Mexico. They are also eager to export their products to the EU and the rest of the world. Isabelle Gagni, Yves Gautier and Daniel Lavoie of Berger. The team of NaanDanJain together with Yamit Filtration, one of their suppliers. The team of SGS. This company is working in Mexico for over 65 years. Guillermo Carabante of hydroponic Systems. At the shows, the visitors were also entertained by games. The team of Pindstrup. They supply their products directly from Denmark or Latvia to Mexico. Over the last years, they have grown significantly in this market. Irma Pardinas Graue and Cuauhtemoc Moreno. Maurice Verbakel of Boal, who was cisiting the show with Jose Carretero of Ridder. They also have a consumer kit. The team of Oasis Grower Solutions. From their factory in Monterrey in Mexico, they supply to growers all over Latin America. Visitors interested in the products of Legro. Hemant Desai and Dhilan Kanakai of KT exports, from India. Andrea Bochini of Urbinatii and Juan Manuel Solorsano of Plasticos Mallos de Villageras, the distributor of the Urbinati machines. The seeder and the seeder line belongs to Urbinati's most sold products in Mexico. Carlos Calderon (right) of Insinsa with a visitor (left). Dimitrios Doukas of Plastika Kritis, who was visiting the show, and Boy de Nijs of Ridder. The team of Haygrove Tunnels; Oscar Chavez, Manuel Logo Uriba, David Rodriguez and Guavanni Tejeza. They are supplying over 50 countries around the world and Mexico was one o their first countires that they supplied out of the UK, where their home office is based. Charlee Rubio of Yeah Brand, who does the marketing for Netafim, together with Hector Kelly and their models. The team of North American Greenhouses. Francisco Valdes, Carlos Ibarra, Guillermo Cardenas and Kerla Magallanes of Yara. Gaspar Santana, Claudia Cownado, Angelica Gallardo and Lourdes Hernandez of Haifa. Izial Martiez Avendaño and Feinanda Aguilar Gonzalez of Cravo. Steven Baker of Mitrelli and Fertirrigation Solutions, Amir Fox of Pro Fit Agro, Roi Levy of Sempro, Itzik Ben Bassat of Sempro and Gonen Paz of Profit Agro at the booth of Profit Agro, who supplies the different products of these different companies. They were part of the Israeli pavillion. The team of Quimica Sagal. The models of FMC are posing for the picture. Jordi Gus and Miquel Ribera of Conic, that produces greenhouse machines together with Ignacio Calderon of El Oasis Invernaderos, who produces seedlings and the distributor of the Conic machines in Mexico. Ronald Begelinger and Oscar Morales of Patron. Emilio Flores, Jorge Salgado and Migueel Fonseca of Biobee exhibiting at the Israeli pavillion. Victor Garcia of Galcon received a visit from a client. Ofer Finkelstein and Iñaki Vergana of Juganu, at the Israeli pavillion. Part of the team of Grupo Inverco, who also distributes Projar products in Mexico. The team of Ina Plastics presenting the new tray for propagation on rails with pugs fro high tech nurseries. On the photo, fltr: Konstantinuous Tsouaris, Gloria Lopez, Carlos Alvarez and Jacob Tsohakis. Jesus Salas of Plast Textil together with their model Cynthia Posada of Plast Textil. Jean Rummenie, Frank Hoogendoor, Marko Teodosijevic and Carlos Hernandez of The Netherlands Embassy. This year, the Dutch pavillion hosted 32 Dutch companies, which made it the biggest international pavilion at the Expo. Cies Roskam of ProEnto was also visiting the show. This company promotes, produces & processes insects as feed for animals and/or food for humans. Adrian Flores Conejo and Migualangel Servin of Irrigacion y technologica Mundial presenting their hydroponic prototype. Busy at the booth of BASF. Seminars being given at the Stoller Acedemy booth. Orlando Mancisidor of TIPO, supplying tomato clips and tomato hooks. Rosaura Marquez, Socorro Garcia, Carilina Ruiz and Mayra Fonseca of HM Clause. The team of Stoller. This US company has an establishment in Mexico. Leyda Gaya of Double Diamond Farms. Hishtil Mexico team talking with a visitor. Magdalena Arredondo of Inverca. This company is celebrating its 30th anniversary. In these 30 years, Inverca has reached five continents and continues to pioneer new frontiers day by day. On top of that, they have manufactured and supplied more than 2,000 hectares of greenhouses for all types of climates and crops. Busy at the booth of PlasInver. Crowded aisles with Erik van Geest of NPI photobombing the picture. Exhibitors being interviewed by local broadcasts. Tom de Smet (on the right) of Hyplast with his Mexican colleague. Fedrico Reyes Almuzan of Erma Zaden. The team of AMHPAC talking with visitors. Ed Smit of JungleTalks was also visiting the show. Mexican students learning more about agri- and horticulture at the show. Juan Pablo Saucedo of AgroSense explaining the Tomsystem to a group of visitors. Alan Pacheco Gomez of Enastas. Manuel Cardenas and Rolando Perales Lims of Agrofacto Morillo. The team of Topseed with their model. Carmen, Daniel, Alfrédo, Raul, Juan and Josue of Bactiva. Joseph, Roberto, Marina, Ricardo, Ana and Lupita of Pure Flavor. Ramon, Hugo and Cubertino of Maquita, introducing their new product. It was busy at the booth of Aquatey. Raymundo, Enrique and Oscar of Luvar. Claudia Mayorga of Mallas Textiles. Roberto, Victor, Juan, Raul, Edgar and Martha of Champion Seed Company. The team of Grupo Crops and Science. They import organic products from USA and sell them in Mexico. Enjoy the games at the booth of Dragon. The booth of Ubiagro, they use drones dedicated to precision agriculture, with the special hardware it is possible to give the healthstatus of the crop. Dennis (of DQ Hortisoluciones) and Francisco, Karla, Emanuel and Lucero of Alltech. Rodrigo Saavedra of GSI, total systems for silos. The team of Altiara, they produce organic products. The team of Premier Seeds. The new machine of Royal Brinkman. Gabriel, Reynier, Michel, Jose, Victor, Boy, Edgar and Ruben of Ridder. 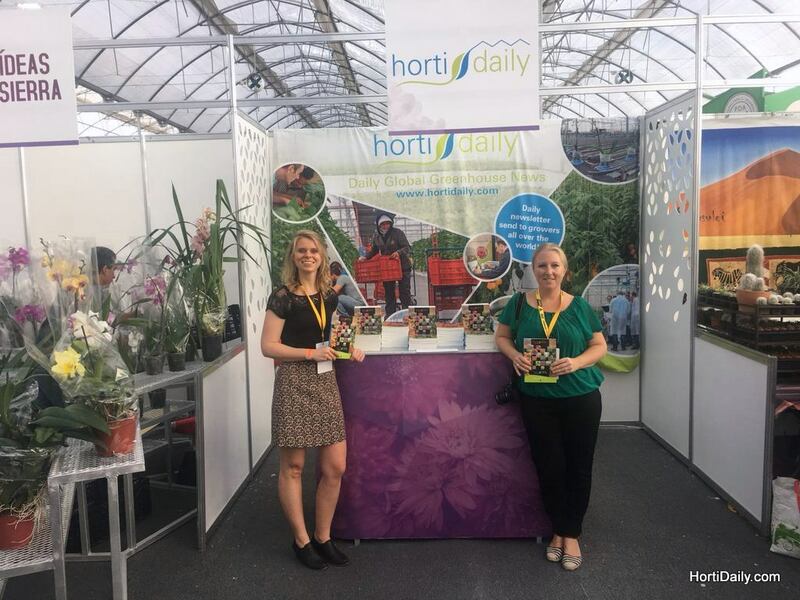 Dutch "stroopwafels" at the booth of HortiConnect. Cynthia Gonzalez y Tere Ugalde of Plantanova. Victor Kano, Philippe Haack and Gerardo Martinez of Gakon. Karin Nienouu and dennis de Zeeuw of DQ Horti Soluciones. Tristan Koop and Joan Hoefsloot of Sion. The new thermo boots of Dunlop. Eva Velazcez of Canada Booth. The team of Rabita Agrotextil. Efrain and Alejandro of Metaliser. Geert-Willem van Weert of Vitotherm, Bert Neeft of Total Energy Group, Peter Ollevier of Phorium and Victor Flores of de Gier. Paola Avila and Angelica Ocampo of CHEP. The team of van Iperen and Sun Parlour Grower Supply. Albert Pinto, Aaron Bickell, Kurt Becker and Louis Damm. The team of Biobest, making sustainable crop management. Juan Carlos Mares, Jose Louis Magaña, Alejandro Vicente, Jose Maria Lopez and Cesar Doñen of Giddings. The team of AGQ Labs. Rajiv Singh Unzon and Jose Carmen Aldaco of IDM. Patrizia Giuliani and Giuseppe Netti of Arrigoni, to promote their high-tech insect proof screen. Luis Saluzar and Sergio Camacho of Fricomsa. Alex Avila, Leidy and Shan Halamba of Riococo. Daniela and Miguel of Biokala. The booth of Mallatex, Grupo Criado y Lopez. Cornelio Luna and Adrian David Diaz de la Torre of AgroExpert. Alfonso Ramos, Lilliana Villegas, MArichel Gonzalez and Carlos Eduardo Cruz of TC Packaging. Doing business at the booth of Ginegar. Magda López Golvan of Mezfer. Victor Angel Gomez and Leonardo Hernandez of NaanDanJain. Sezin Tezcan and Juan Carlos Garcia of Dogal. Interview about introducing the new pears of the Greenery. Sergio, Jorge and Homero of Svensson. The greenhouse of MSC, VoloAgri and US Agriseeds. Lark Seeds is showing their products. Westar is showing their products outside. The fruit of Rijk Zwaan. The greenhouse of Rijk Zwaan. Giving information at the booth of Koppert in the Greenhouse. New Holland was well represented with a big booth outside. The team of Yüksul Tohum. Pablo Vazquez and Joss Bravo of Crawford Packaging. Miguel, Mitzi, Fernanda and Jesus of Agricola Barragan. Rosanna Zatarain and Julio Patiño of Hazera. Jorge Louis, Jorge and Manuel of Tunneltek. Laurengi Jaimes and Isley Vivas of Westar. Cesar Calderon Piña and Valeria Flores of MF Nutrigota. The team of Acadian Plant Health. The beautifull booth of Agrizar with nice snacks. Beatriz and Gonzalo of King Seeds. Juan Antonio Muñoz and Shade Vega of Novasem. Busy at the booth of Rivulis and Eurodrip. Mother and son with their beautifull products. Roy and Edgar of Cornbak. John Deere was well represented. It was a busy day at the Agroalimentaria. Massey Fergunsun was well represented. Jorge Peña Robles of PatroMex. Happy visitors on a sunny day.